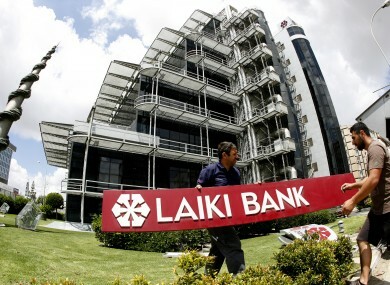 Workers take down the signs at the headquarters of Cyprus' now defunct bank Laiki in Nicosia today. THE INTERNATIONAL MONETARY Fund has approved a €1 billion bailout loan for Cyprus and released the first €86 million to the Cypriot government. The loan is part of a combined €10 billion emergency financing deal set by the IMF and the European Stability Mechanism that aims to support the government as it seeks to stabilise the ravage Cypriot banking sector. “It is intended to stabilise the country’s financial system, achieve fiscal sustainability, and support the recovery of economic activity to preserve the welfare of the population,” the IMF said in a brief statement. The announcement came two days after the ESM, the European Union’s new financial stability backstop, handed over the first two billion euros of loans agreed under the controversial Cyprus aid deal. The deal was set in March after the Cypriot government agreed to force depositors and bondholders in Cyprus’s leading banks to take huge losses in order to keep the country’s banking system from imploding. Email “IMF gives the ok for €1 billion bailout loan for Cyprus”. Feedback on “IMF gives the ok for €1 billion bailout loan for Cyprus”.